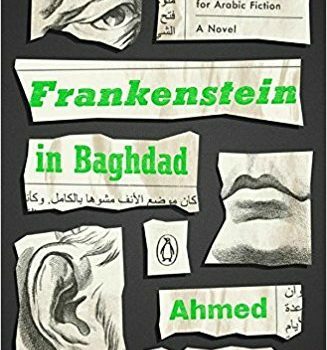 Frankenstein in Baghdad, Ahmed Saadawi, translated by Jonathan Wright (Penguin Books 978-0143128793, $16.00, 288pp, tp) January 2018. Ahmed Saadawi’s Frankenstein in Baghdad places the eponymous monster amongst the suicide bombings and devastation of Baghdad in 2005. It opens with an attack on Tayaran Square where a soul, torn from its body, finds a home in a vacated corpse. It’s no ordinary cadaver, but rather a stitched-together amalgamation of parts, the remains of the people who died in previous attacks. This grisly conceit, inspired by but not beholden to Mary Shelley’s classic, sets the scene for a funny, tragic, powerful, and deeply moving novel about Iraq and its people, and makes Frankenstein in Baghdad firmly of interest to genre readers. It was a fresh nose, still coated in congealed, dark red blood. His hand trembling, he positioned it in the black hole in the corpse’s face. It was a perfect fit, as if the corpse had its own nose back. Aside from Hadi and his creation, Saadawi introduces the reader to a number of characters, each of whom embodies an aspect of Iraq. The sense of loss and death is embodied by Elishva, the widow, waiting patiently for the return of her son, Daniel, who disappeared during the Iran-Iraq War (a reminder that the countries’ battle wounds run deep). The naïve hope for a better future is embodied by Mahmoud al-Sawadi, an ambitious journalist desperate to give his people a voice. The sheer lunacy of the war, of all wars really, is embodied by Brigadier Sorour Mohamed Majid, the head of a secret organization funded by the United States, the Tracking and Pursuit Department, that relies on astrologers to predict the site of the next bombing. And then there’s Whatshisname, Hadi’s creation, an animated, self-aware corpse, a literal embodiment of the Iraqi people. What does he represent? Revenge and justice, of course. Will I fulfill my mission? I don’t know, but I will at least try to set an example of vengeance – the vengeance of the innocent who have no protection other than the tremors of their souls as they pray to ward off death. But he acknowledges that, as hard as they might try, his followers can’t vouch for the purity of the body parts. He therefore speculates on how this will affect his soul. This debate – is Whatsitsname good, is he evil, is he something in between? – is part of a wider existential discussion about Iraq and its people, in particular, their sense of futility, their desire for justice against those who have devastated their country, and, above all, their yearning to lead ordinary lives. 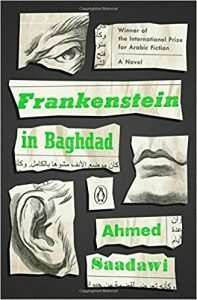 While the subject matter is heavy, what makes Frankenstein in Baghdad so readable, so entertaining, is Saadawi’s tongue-in-cheek attitude. He never allows us to forget the human toll, the senseless death, torture, and misery, but he also has fun at the expense of those in power, especially the ridiculous, Monty Python-esque Tracking and Pursuit Department. 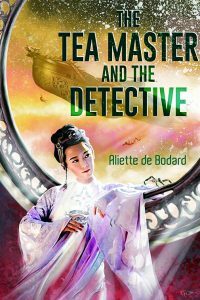 There are some laugh-out-loud moments as the junior astrologer embarks on a Machiavellian plan to overthrow the senior astrologer (with the help of a certain patchwork cadaver). Less successful is Saadawi’s effort to inject ambiguity into the narrative, suggesting that Whatshisname is a rumor, a myth, a figment of the imagination. The symbolism of Whatsitsname is strong enough without muddying the waters. Frankenstein in Baghdad has recently been shortlisted for the Man Booker International Prize, and it is brilliantly translated by Jonathan Wright. 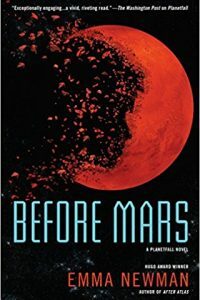 I’d like to think that the novel will also garner serious interest from genre awards next year. It’s certainly deserving of our undivided attention.